The message of Stan Wawrinka and his incredible win at the Australian Open Sunday over Rafael Nadal, a few days after his incredible win over Novak Djokovic, has been twisted a little. Simplified. Confused. That is not about continuing to try until you have success. It is about redefining success, finding it in the nobility of simply trying and trying no matter how many times you fail. It’s not about trying until you succeed, but rather about finding success in the effort. It tennis terms, it was a way of keeping sanity in a world of Nadal, Djokovic, Roger Federer and Andy Murray. It is such a great example of a blue-collar mentality and a look into what it’s like to be a top tennis player dealing with the sport’s historically incredible Big Four. “Before today, I always (was) saying that except Roger, Rafa, Novak, you always lose, especially every week,’’ Wawrinka said Sunday after beating Nadal 6-3, 6-2, 3-6, 6-3 to break up the Big Four’s stranglehold on major championships and win his first major. “So it’s not easy because tennis life, when you lose, it’s tough to get through and to take a positive from a loss, from failing from a tournament. The Big Four had won 34 of the previous 35 majors, going back to 2005. 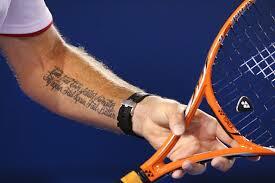 The string was broken only by Juan Martin del Potro’s 2009 U.S. Open win. But at the time, del Potro seemed a likely candidate to join the top group. If not for wrist injuries, maybe he would have. But he’s healthy now, and still can’t quite get back. Wawrinka didn’t seem like the guy to break through. He was destined to be the guy Djokovic beat in a classic five sets at last year’s Australian Open, and then again at the U.S. Open. He was The Other Guy in the picture of greatness. He was good enough to get into that picture, though, which maybe made it more frustrating. He found comfort in the Beckett quote, which he thought about for years, but didn’t have tattooed on his arm until last year. 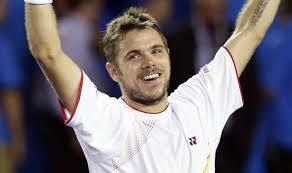 Wawrinka said Sunday that he never believed he could win a major until after he had actually done it. The success was in the courage it took him to keep getting up and fighting after crushing and inevitable losses to the greats. The Australian Open? That was just a bonus. Wawrinka was 0-14 against Djokovic, 0-12 against Nadal. He’d never even taken a set off Nadal. 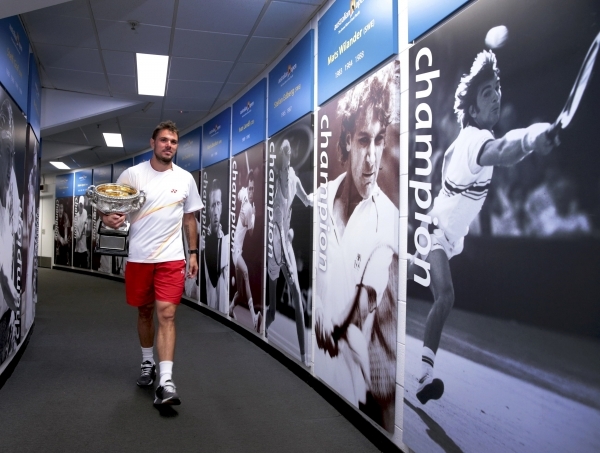 Being from Switzerland, Wawrinka also spent his career in the shadow of his friend, Roger Federer. Now, Wawrinka moves to No. 3 in the rankings, ahead of Murray and Federer. But the beauty of Wawrinka’s story is in the process, the failing that led to this. We love to celebrate the blue collar guy in sports, connecting him to ourselves, and to a belief that it’s possible to break through the ceiling. Wawrinka, who’s 28, wasn’t just some nobody from nowhere, though. He was a top prospect in 2006, with Djokovic, and has worked his way up the rankings. Even before this Australian Open, he was ranked in the top 10, and had made $9 million in his career. You can buy a pretty nice lunch pail with that. Wawrinka found hardship in his inability to break through the Big Four, though. He found solace in the fact that no one else could do it, either. But really, the Big Four was just the Big One for a while. Federer. Then Nadal broke through and made it the Big Two. Then Djokovic. Three. Then, last year, Murray. So it’s possible. Wawrinka has crushing power, heavy shots and an incredible backhand. Last year, after 18 months without a coach, he signed with Magnus Norman, who has convinced Wawrinka that losing isn’t inevitable. On Sunday, Wawrinka attacked Nadal. Usually, Nadal bullies opponents around the court. Wawrinka was crushing him. Early in the second set, Nadal threw out his back, but I don’t see that as a bad break for Nadal. From there, Nadal couldn’t run and had no power. And Wawrinka, facing the reality of what he was about to do, something he never thought would happen, fell to pieces. He handed Nadal the third set. It’s hard to say for sure why Nadal didn’t quit after the second set, rather than risk more injury. He said he wanted to fight to the end. The crowd booed him when he left the court in the second set for a medical timeout, thinking it was gamesmanship and he was trying to throw off Wawrinka. A few years ago, Nikolay Davydenko was on the verge of breaking through. I was at his match against Federer in the Australian Open. Davydenko was rolling over Federer, who suddenly left for a bathroom break. He later admitted he didn’t have to go to the bathroom. And with time to think about what was happening, Davydenko then fell apart. By the end of the Nadal-Wawrinka match Sunday, though, the crowd realized Nadal really was hurt. It was obvious. They cheered him; he seemed to have tears. But I think, part of the reason Nadal kept playing was out of respect for Wawrinka. He didn’t want to take away from Wawrinka’s big moment. Eventually, Wawrinka broke Nadal’s serve and calmed down. Well, the Big Four looks a little vulnerable now. Nadal missed seven months last year with knee injuries, and now is hurt again. Murray just returned from back surgery. Federer changed racquets, coaches and styles to fight off getting old. He looked better than he did last year, but is now ranked No. 8. You wonder how other players struggling the way Wawrinka had, will see what happened Sunday. David Ferrer? Even del Potro? Tomas Berdych, who had celebrated a few days earlier being the only person out of the Big Four to reach the semis of all four majors in his career? Did Wawrinka show them that there’s another step? That the Big Four are beatable in the big moments? “They are just better than us,’’ Wawrinka said. He said that what Beckett’s quote meant to him was to just keep going back to the practice court. There was victory in that alone. Just keep fighting even if losing the big match was inevitable. What he found out Sunday, as a bonus, is that it wasn’t. This entry was posted on Sunday, January 26th, 2014 at 6:51 pm	and tagged with Andy Murray, Australian Open, Novak Djokovic, Rafael Nadal, Roger Federer, Stan Wawrinka and posted in Australian Open, Uncategorized. You can follow any responses to this entry through the RSS 2.0 feed. Wawrinka’s ground strokes, and humility, were a joy. Younger challengers, Dimitrov and Nishikori, also made life difficult for Nadal. Exciting times ahead for tennis fans! Yeah, but why did he miss those 4 break points? It was because his opponent gave him time for the occasion to sink in. Actually, I don’t see it as such a bad thing: If a breather was all it took for Davydenko to self-destruct, then the right man lost anyway. At the time Davydenko missed the breakpoints he was already up a break (3-1)! Do you think the occasion didn’t sink in in Federer’s second service game of the set, much closer to the bathroom break, but only games later at 3-1? I think Davydenko self-destructed because he missed the chance to go up a double break and possibly 2-0 in sets, and it had nothing to do with the bathroom break. How many times do you see missed break opportunities come back to hurt you the next game.